On Early Retirement: Fish Stories - All True! I have become a deep sea fisherman (-woman???) since I retired. I didn't plan it that way, but my boyfriend lives to fish and I like being out on the ocean, so it made sense to learn. And, as it turns out, I'm really good at it. He's a very good teacher, and I certainly got lots of practice. He made me start out with small fish in the bonito family that no one wants to eat. When we find them, there are a bunch, and they all hit those lures at once! They fight very hard so it's very exciting for the time it takes to reel them in, but I soon got tired of doing all that work for something I just have to throw back in the water. It was a good way to learn, but I try to steer the boat away from them as much as possible now. Then he taught me how to catch dorado, also know as mahi-mahi. The one above is my very first - they get much bigger. Dorado are fun because they jump high into the air trying to loosen the hook from their mouths. It wasn't unusual for us to each have a dorado hooked up on opposite sides of the boat. In those days, we had old light equipment. Once we each broke a pole and lost a dorado, maybe two minutes apart. Now we have better equipment. Terry kept telling me how crazy and fun it is to find a bunch a tuna because they all hit at once. But the tuna never seemed to be there when I was. 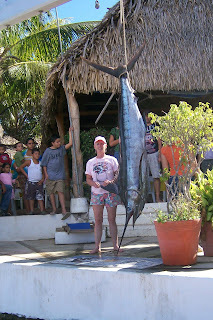 One day he called me at my home in Chapala, very excited because they had found a bunch of tuna that day. I quickly packed up my car and drove the 225 miles to the beach so I would be ready to fish the next morning. So we go out fishing and after a while we get a fish on. The guys handed me the pole and I sat down in the fighting chair to bring in my first tuna. I was thinking the whole time, "What's the big deal here? It feels just like a dorado to me." 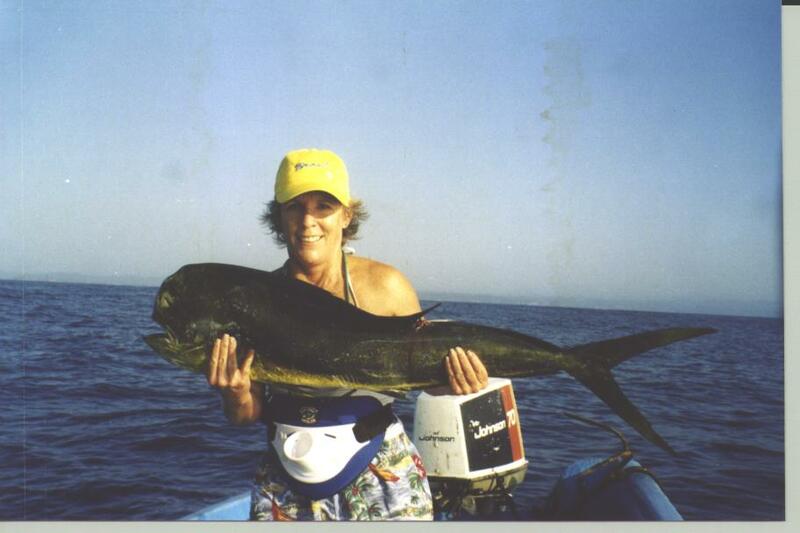 So I get the fish close to the boat and, sure enough, it's a dorado - right in the middle of the tuna. But right about the time we got the dorado in the fish box, all the other poles went down and we had four tuna on at once. It continued on that way until we had our limit for the day. Yep, tuna fishing is very exciting! Another day, Terry and I were out fishing by ourselves and we were having pretty good luck with dorado. Then we both happened to be looking in the same direction and saw a marlin jump out of the water not too far away. We quickly reeled in the lures and headed in his direction. I think it may have been on the second pass that we hooked that marlin. Hooking him was the easiest part. I had carefully fought that marlin (we had the light equipment) for an hour and a half before he up and had a heart attack and died. Dead fish sink and that one went straight down. Luckily, a friend of ours saw us and radioed to ask if we needed help. He came over to our boat and he and Terry spent another hour and a half carefully pulling that 300 pound fish to the surface. I posed with him for the photo at the top and then gave the marlin to our friend. Over the past six years I have caught a lot of fish and had lots of fun doing it. I hooked a tarpon at Boca Grande in Florida (that one got away), caught sailfish at Zihuatanejo, and Spanish Mackerel, needle fish, and jacks right close to home. I even played tug-'o-war with a sea lion over a chula (tuna family). It was a tie, I got the fish but he took a big bite out of it. But each year Terry got bigger and better equipment and it seemed to me that the big stuff took the fun out of it. It became too automatic. So, now I've decided to retire from fishing and leave some for the guys. Too much sun out there for this Swedish skin! Besides, I can still go out any time I decide I want to go.